Hi! 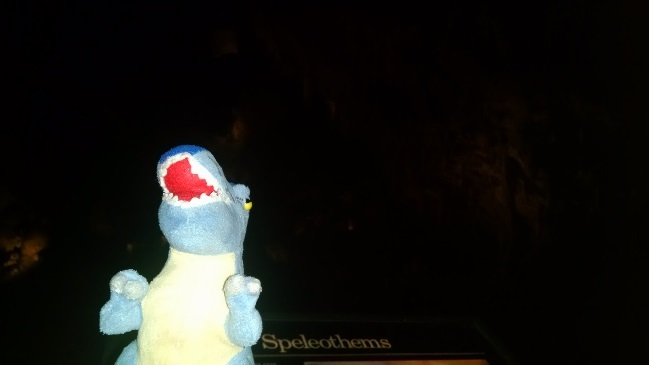 It’s me, Archie the Wandering T. rex! After seeing the National Parks Adventure 3D giant screen movie and spending time at National Parks Photography Project exhibit, I got inspired to go on my own adventure. 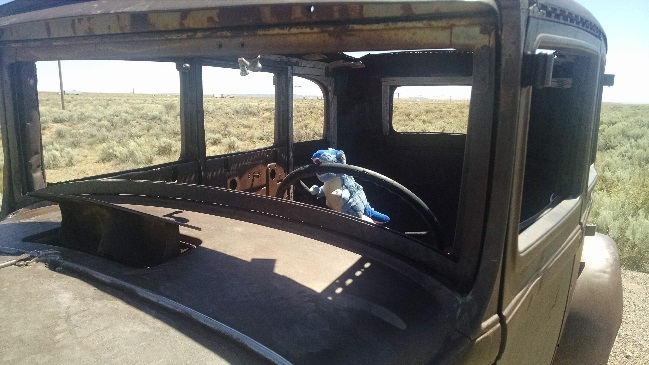 Fortunately, I was able to hitch a ride and head out on the highway, looking for adventure, or whatever comes my way. The epic road trip went across 3 states and 8 national parks. I was excited, but it took 2 days just to get out of Texas!!! We finally made it to New Mexico and our first National Park–El Malpais National Monument. Although the name means “bad place”, it was quite beautiful there. A lot of these formations started in the Cretaceous period, so I was amazed to see what happened in the last 65 million years! 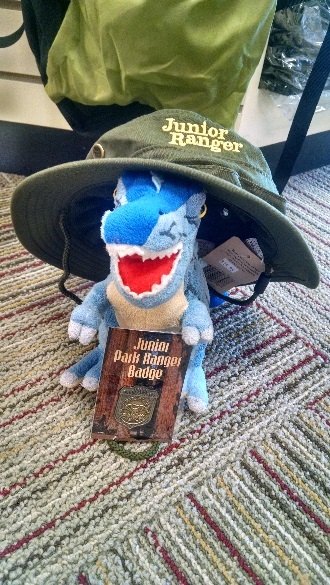 I am the kind of dinosaur who like to make the most of my travels, so when I heard about the Junior Park Ranger program, I said, “Sign me up”! I think I look pretty good in uniform, don’t you? 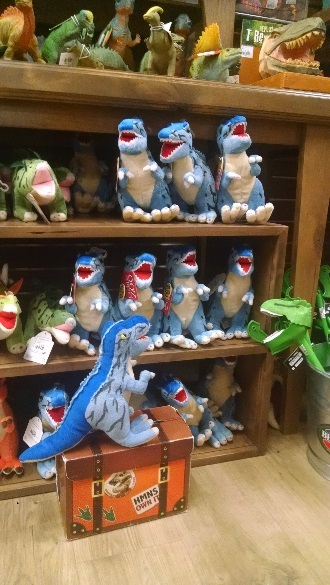 Speaking of catching up on the past million years, I had an unexpected family reunion at the Rainbow Forrest Museum in Petrified Forest National Park. I know what you’re thinking: “Archie, the Petrified Forest features reptiles from the Triassic Period, and T. rexes weren’t around till the Cretaceous!” Well, my mother raised me to respect my elders, and if these ancestors are a few million years older than me, I’m still going to stop by and say hi when I’m in town. 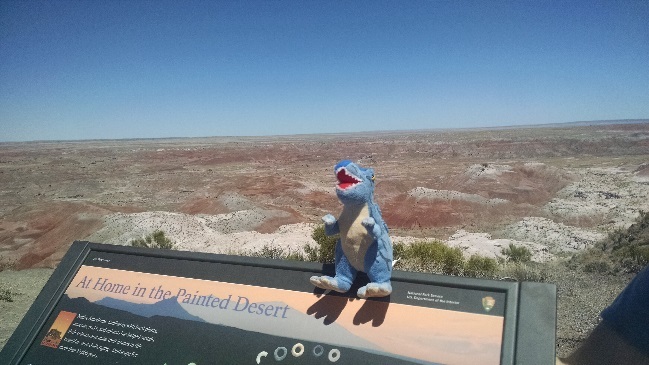 Why yes, I did feel at home in the Painted Desert! The next day was the big day—the Grand Day, if you will. I got to raft on the Colorado River, and they even let me pilot the boat for a little bit. Since the river runs through the arid climate of Arizona, early Native American tribes settled in the area. We disembarked and viewed the petroglyphs on the canyon walls! The Grand Canyon itself was so amazing, I forgot to take pictures. All I can say is that everyone who has the opportunity should go visit! It was a reminder of what a wonderful world we do live in! After that, the trip headed south—literally! Even though Montezuma’s Castle wasn’t built for royalty, it was impressive to see the cliff dwellings from hundreds of years ago. (But they want to tell a dinosaur about ancient? Please!) 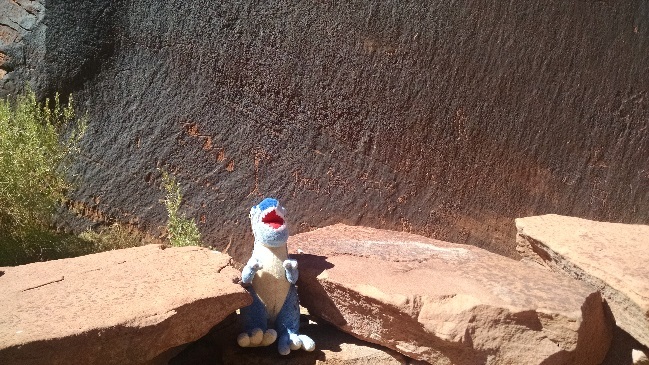 Saguaro National Park was also a spectacular site, thick with cactus that can even poke a T. rex. I didn’t realize how tall they got—they can be as tall as a T. rex is long! That’s 40 feet. I never thought I’d be intimidated by a cactus! Since dinosaurs prefer warm environments, I’ve never really tried winter sports. Imagine my delight sledding on the sand dunes at White Sands National Park! 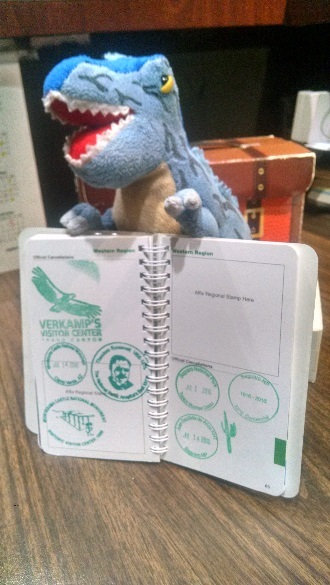 On this trip, I also found out that you can get a National parks passport and get stamps at every stop. I have so many now! When we went back through Texas I thought we were heading home, but it turns out El Paso is closer to San Diego, California than it is to Houston, Texas. No wonder it took two days to leave the state! The Guadalupe Mountains is the highest peak in Texas, and it contains Permian reef. Of course I felt so at home out there. This is a dinosaur dream trip! We went from the highest peak in Texas to the low parts of New Mexico, and descended into the caves of Carlsbad Caverns. In the evening, I got to see some of the cave residents, when all the bats came flying out at dusk! There are over 400,000 Mexican free-tail bats living in the cave, and they are all hungry for mosquitos. I love bats! Unfortunately, all good things must come to an end. After driving around for 3,000 miles, it was sure good to be back at HMNS . . . until I get inspired by the next exhibit. The Bill of Rights is coming soon! Does anyone want to do some research in D.C.? Road trip!!! I wonder if you are acquainted with Traumador, another small wandering tyrannosaurid with a plush complexion.